Spain's total population density is approximately 90 inhabitants per square kilometer and it is obviously not distributed evenly throughout national territory. Due to the fact that the coast of the Spanish peninsula is much more populated than the interior, the most densely populated Autonomous Communities are those which have access to a piece of the coast, especially both sets of archipelagos (Canary Islands and Balearic Islands), Basque Country, Catalonia, and Valencia. 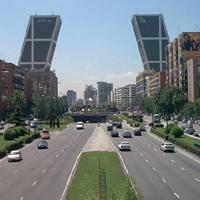 Spain's most densely populated Autonomous Community, however, breaks this general rule: Madrid, with figures that reflect a large metropolitan area.